We bring assembled sauna houses with either woodburning or electrical heaters.Sauna house outside is tar-treated.End walls feature air vents and there is an air vent in the steamroom.End walls are braced with stainless steel ribbon plates.Every sauna haouse is equipped with a heater,water tank,chimney.Steamroom bench is made of aspen or black alder and treated with tar oil.Roof is covered with the long-term honey comb (cellular) roofing felt (Icopal).You can choose between a wooden or glass door.Barrel sauna can be easily moved!Sauna house can be used as a garden house, summer cottage…We make saunas tailored to your wish and measures.Sauna user manual is attached. 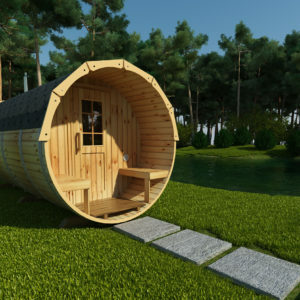 Sauna houses are tar-treated outside! 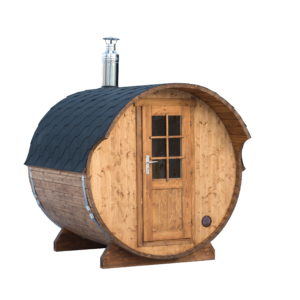 Dipping oneself in warm water is healthy and relaxing activity!You will find wooden and plastic barrel saunas of different size in our shop.Stoves for barrel heating have the interior or exterior burning.Chimney from stainless steel is 200mm long.Barrel wall is 40mm thick and 115mm tall,seats made from 28mm thick wood. 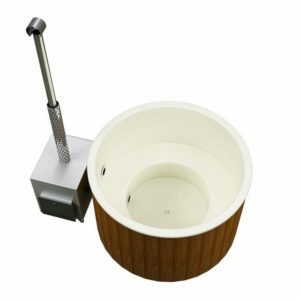 Barrel’s cover is from wood or PVC coating.Barrel is braced using 2 adjustable ribbon plates from stainless steel.Barrel accessories include drink tray, stairs.Barrels are treated with tar oil from outside!